My good friend and neighbour Marea Gazzard died yesterday. She approached the end of her life with the same dignity with which she'd lived it - as she had wished to do. Marea was a ceramicist and sculptor of international renown, who had also played an active and most productive role in closely linking art and craft in Australia. I loved chatting with Marea. As well as hearing her talk about art and aesthetics more generally, I loved her stories of travel, and of Sydney in the 50s and 60s when she seemed to know all the people who went on to build the cultural life of our city. Today I watched the brief interview with Marea that was done for the ABC in 2010. She's surrounded by her work in her living room, that was also her studio and gallery. I was very moved when, towards the end of the interview she speaks of her wish that some of her work might have a timeless appeal - that it will be appreciated into the future. 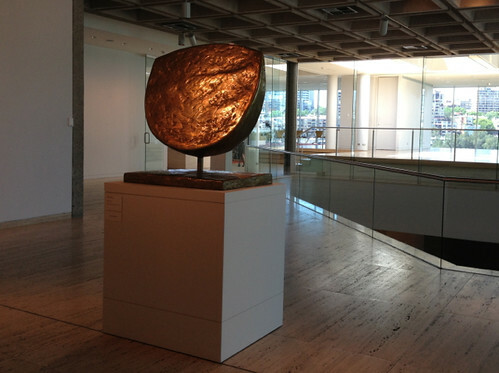 It's fitting that the Art Gallery of NSW recently acquired one of her works - Selini 1 - and that it has featured in the main entrance hall over the last few weeks. A most appropriate way to acknowledge her work. Like so many of Marea's many friends, I will miss her presence in my life. I seem to have another troublesome knitting project on my hands. This time it's not the knitting itself, as the project could hardly be simpler. 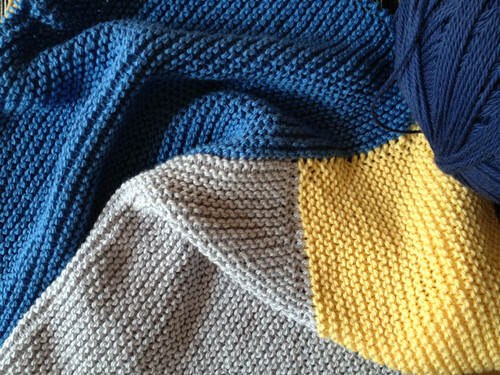 I'm knitting Kay Gardiner and Ann Shayne's Moderne Baby Blanket, which is all neat-edged garter stitch. Easy-peasy. But so far the blanket has been surrounded by (admittedly minor) difficulties. So far I've knitted nothing for my grandson Joshua, who's now two and a bit. He lives in the Philippines where it's just too hot for knitted garments of any kind - even those from cotton. But I've really wanted to knit for him, and for knitters, knitting is an expression of love and attachment, so I've finally decided to knit him a cotton blanket. It can be used for him to lie on, or to cover him if he sleeps in air-conditioning. Or it might not be used at all, but I will have had the satisfaction of expressing my knitterly affection. In a moment of madness I decided I could complete this project in the two weeks leading up to my most recent visit to the Philippines. Perhaps fortunately, fate and Australia Post conspired to make this impossible. I'd ordered 8ply cotton from Bendigo Woollen Mills and it just didn't arrive. And didn't arrive. 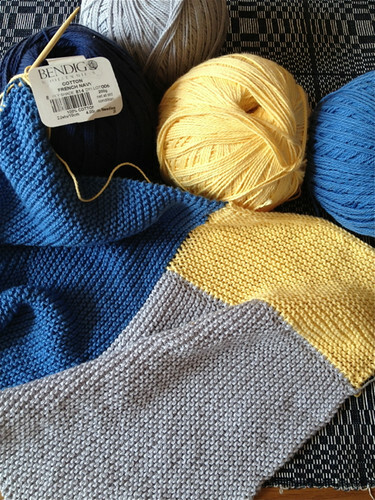 [Bendigo cotton, by the way, is perfect for a project such as this. Reliable quality, washes well, relatively inexpensive. It would be good if it came in some more exciting colours, but maybe that's a trade-off for its reliability]. I checked that Bendigo has sent my yarn promptly, but then had no way of finding out what had happened to it once it was in the hands of Australia Post. Frustration. Eventually, as I checked my mailbox on the way to catch my plane to the Philippines I found a final notice to collect the parcel from the post office. This is not the first time I've received a final notice without ever having received an earlier notice. Double frustration. Fortunately I was able to phone the post office and arrange for them to hold the parcel till my return. I couldn't bear the thought of the parcel being returned to Bendigo and then having to be resent. Now the only problem is how to complete the blanket and send it to Joshua. The Philippines postal service is even less reliable than Australia Post. Things not only get lost - they are never found. If I finish it by Christmas time I can send it with a friend who is travelling to the Philippines. Normally, this would be an easily feasible schedule, but I will be travelling in the US and Mexico for five of those weeks, and a cotton blanket is not a sensible knitting project when doing lots of plane, train and bus travel. So, I'm hurriedly making a start on the project, and hoping to complete the acres of garter stitch between my return home in early December and Christmas time. I'm telling myself that I always work best when I have a deadline. Let's hope my slightly arthritic hands get the message. Rather gratuitously - here's a pic of the intended recipient. I can't imagine he'll appreciate the blanket, but his parents and I know it will come with lots of love. the use and display of stark images of persons in extreme poverty that border on the exploitative and intrusive, in order to generate sympathy and donations, to increase newspaper circulation and TV ratings, or even to gain fame. In her view, even noble ends do not justify exploitation. 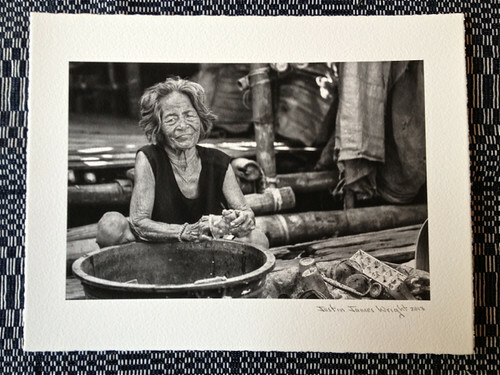 Many of the most striking photographs were of children, but I was taken by this photograph of Loretta, a woman in her seventies who still works at recycling discarded items to survive. The matter of how to depict the world around you came up again in a different way. 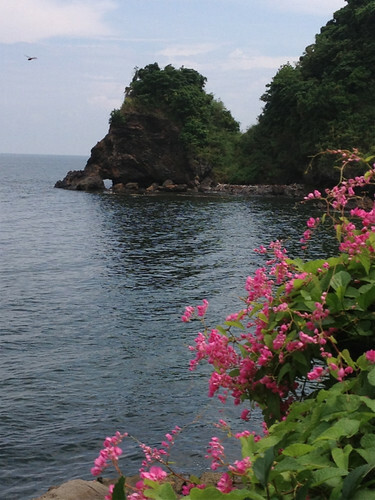 While I was in Manila we decided to visit Corregidor Island - a rocky island within the entrance to Manila Bay that has been used to fortify and protect the Bay for many centuries. Over time it had been inhabited by the Dutch, the British and the Spanish as colonial dominance of southeast Asia and the Pacific ebbed and flowed. 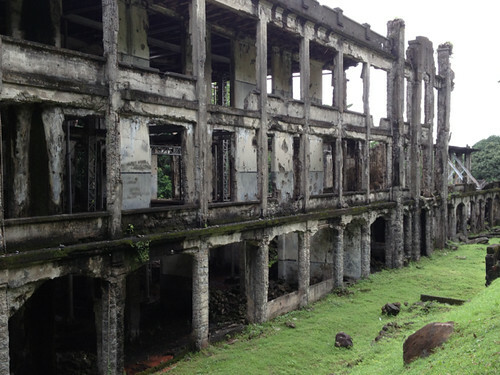 At the end of the nineteenth century the island, along with the rest of the Philippines, was ceded by the Spanish to the USA after the Spanish-American war, and across the first half of the twentieth century Corregidor became a significant military base for the US colonial victors. There are reminders of the American presence in the extensive ruins of barracks, guns and mortars across the island. 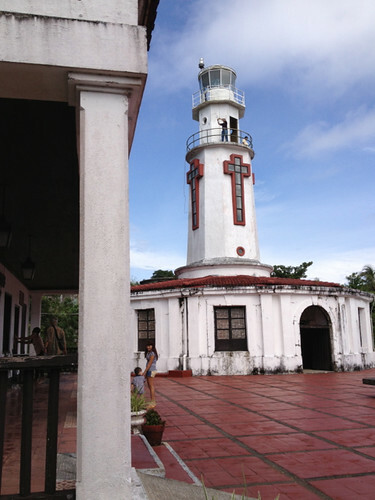 Corregidor is best known as the last heroic stand of the American and Filipino troops against the Japanese invasion of the Philippines in the early stages of the Pacific phase of the second world war. In 1941 the Japanese invaded the Philippines from the north, until the allied troops retreated to Corregidor. Even after the formal surrender of the mainland trooops to the Japanese, and the infamous Bataan death march, the troops on Corregidor continued their resistance until in May 1942 General Wainwright surrendered to the Japanese forces. 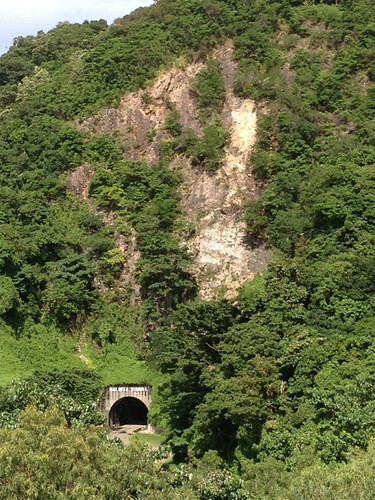 For the last phase of resistance, around 7000 troops sheltered from constant Japanese bombardment in the Malinta tunnel - a main tunnel about 200 metres long with lateral tunnels forming barracks and hospitals. 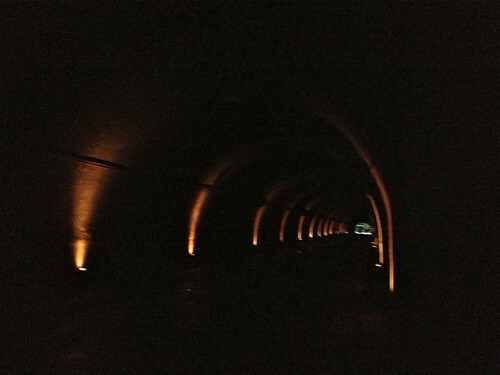 We took a tour of the island on a 'tramvia' - an attempt to recreate the trams that once joined the various sites of the island - and went to the sound and light show that described the experiences of the Malinta tunnel. Our visit raised the usual questions of how best to represent the past to those of us inhabiting different times and different cultures. Coming from Australia I have no difficulty in accepting that we need to memorialise defeats as well as victories, and, in this case, Corregidor is also a site of victory as there was a battle in 1945 in which the island was re-taken from the Japanese. Inevitably, history needs to be simplified for casual tourists, and in a country where many of the inhabitants, including some of the still most powerful families, either were forced or chose to cooperate with the invading Japanese forces, 'history' can be a divisive force and is best dealt with delicately. One of my greatest regrets is that a visit to the island isn't possible for more people, as the 90 minute boat trip to and from the island and cost of the tour is prohibitively expensive for most Filipinos. War history isn't my thing at all, but I'm always fascinated by people's stories in challenging circumstances. How did General Wainwright cope emotionally with surrender after resisting so valiantly and fruitlessly? What were the stories of the female nurses who chose to stay on the island through the worst of the bombardment and nurse the injured? How did the US and Filipino troops relate to one another when forced into close proximity? What risks were taken by residents of Bataan in smuggling supplies to the island? Inevitably, there were lots of stories we weren't able to hear. Somehow, a pleasure that occurs through happenstance is doubly pleasurable. 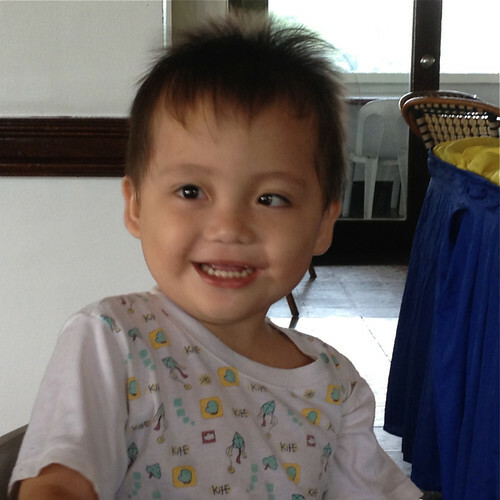 I'm in Manila, Philippines, for a brief family visit. 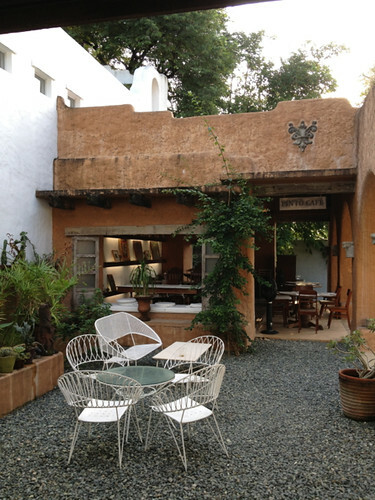 Yesterday we filled in an afternoon by visiting the Pinto Art Gallery in Antipolo, an old area of Spanish settlement in the hills that surround Manila. The Gallery - and even more so the Silangan Gardens that surround it - were a delightful surprise. 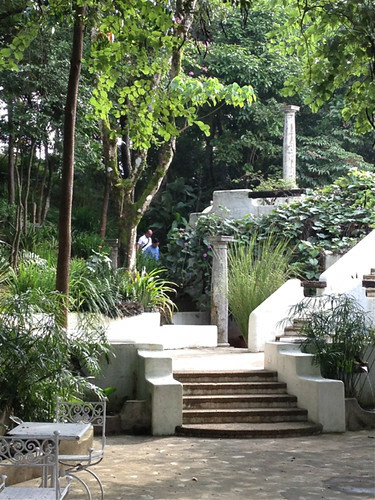 The complex of Mexican style buildings and galleries descends the hillside, with winding paths, shady trees, ponds and fountains, half-hidden sculptures, rustic benches, and arrangements of tables and chairs for lingering and chatting. We wandered through the gardens and galleries - my small grandson particularly delighted by the steps and open spaces. 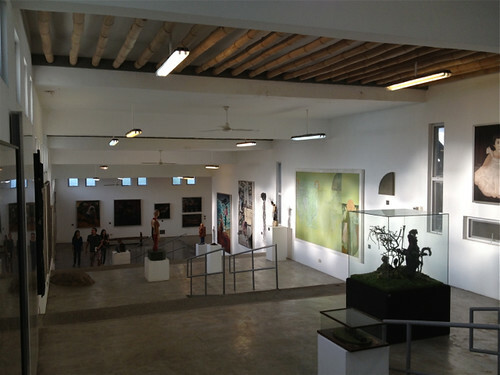 The spacious, inter-linked galleries are hung with Filipino art from the early 1990s to the present. The galleries and garden are the creation of neurologist and art patron Dr Joven Cuanang - and there's the first happenstance. Several years ago Dr Cuanang treated my son for a serious spinal condition, and, fortuitously, he was in the gallery yesterday for the opening of a new exhibition. I'm not really sure that he remembered Michael, but if not he gave a most gracious impression of doing so. 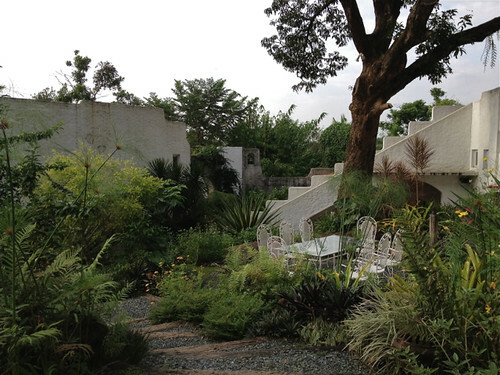 My favourite part of our conversation was Dr Cuanang's response to my heart-felt compliments on his garden. When he told me it was all his own work I must have looked very astonished as he hastened to elaborate that he had given all the instructions to the workers. Inadvertently, we had gate-crashed the exhibition opening, though I'm not sure if it can still be considered gate-crashing if you converse with the host of the occasion. 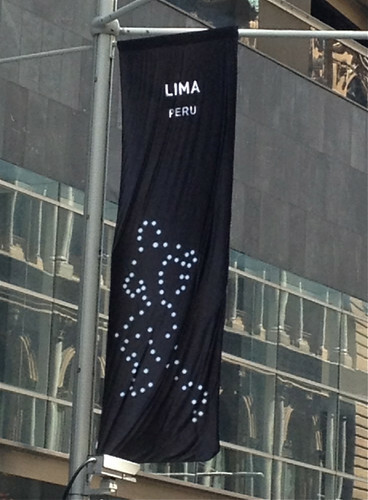 There were glasses of bubbly, and politicians, telenovela stars, and a sprinkling of ambassadors in attendance. I even got to chat with the Australian ambassador, and there were lots of opportunities to brush with local fame. Happenstance that we chose to visit just at the time of the exhibition opening. We didn't feel sufficiently at home to stay for the food that followed the opening and so we took our merienda at the garden coffee shop. The food took ages to arrive, but I think the delay was forgivable when we discovered that the yema pastries that accompanied our salted caramel ice-cream were literally freshly baked. [Yema, by the way, are filipino sweets made (nowadays) of condensed milk and egg yolks. 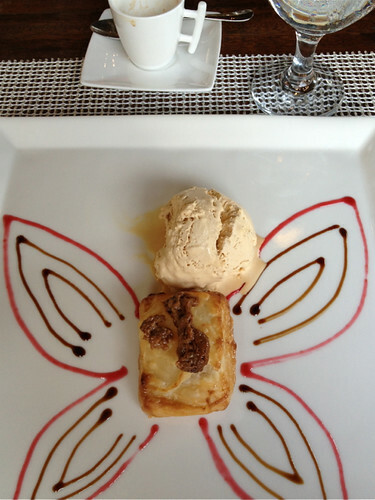 Our pastries had a most refined version of yema as the filling between the delicate pastry layers]. 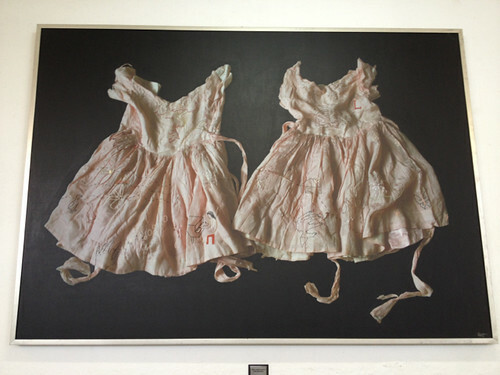 After many of the more famous guests had drifted away we went to view the works of Daniel de la Cruz, whose exhibition was the occasion for the gathering. 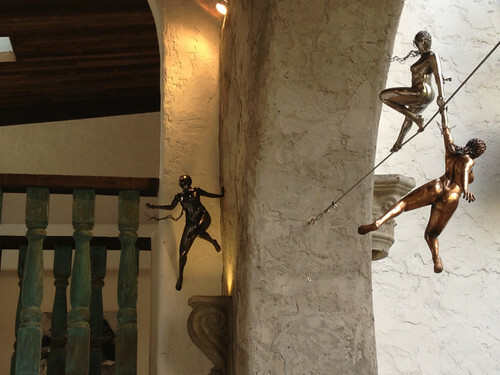 Many of the works were quite delicate feminine figures, often in precarious positions, but still in graceful control. A fun afternoon. Wonderful gardens and well-displayed art, lots of space for my two-year old grand-son to run around, and opportunities for celebrity-spotting for the locals. 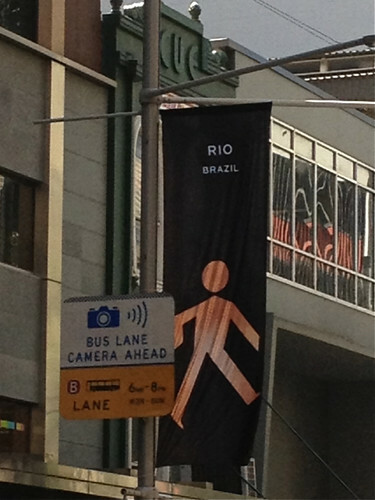 Sydney is not really renowned for its great art. I think you'd probably rank Melbourne, or even Canberra with its national institutions, higher on a scale of artistic notability. I think Sydney's glitz, and the overwhelming attractions of its Harbour distract from artistic expressions, unless they're the grand crowd-pleasers like New Year fireworks or the Vivid street lighting spectaculars. But from time to time, Sydney does its best. 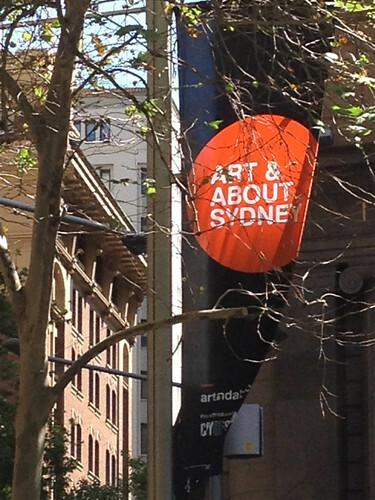 Each Spring, for the last twelve years, the Sydney City Council has organised Art and About, which they describe as 'art in unusual places'. 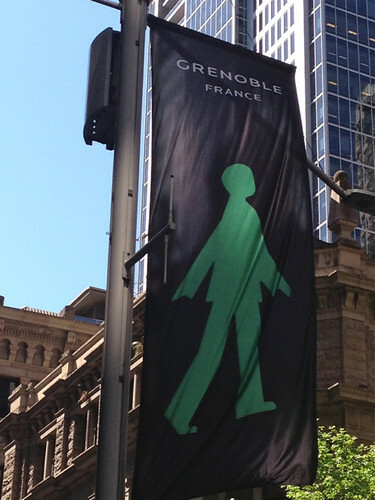 In what I think is a very sydney-like gesture, it brings art to the streets. 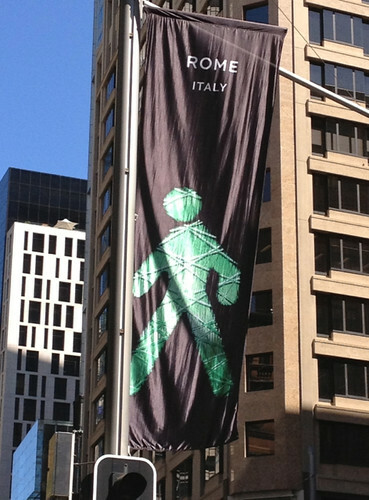 I'd seen the banners hanging in my local main street and wondered why they depicted the 'walking man' of pedestrian crossings. 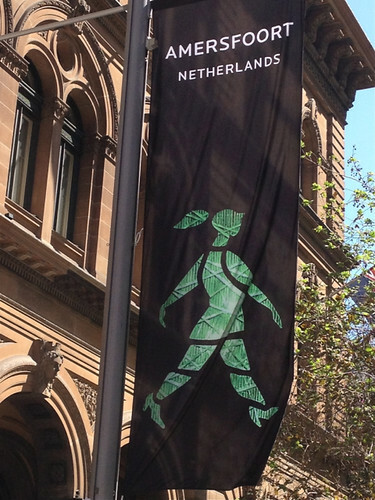 Then I noticed there were cities and countries listed on the banners, and finally I looked carefully enough to realise the walking figures were subtly different from each other. As I've made my way around inner Sydney in the last few days I've noticed them on the streets of other Sydney 'villages' - in Darlinghurst and Glebe as well as Redfern - (the City Council likes to refer to inner-Sydney as a 'City of Villages') and most noticeably on the main streets of the city itself. 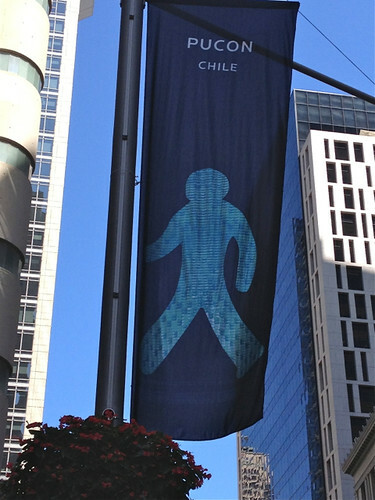 The man from Grenoble walks jauntily with his scarf floating behind; the scurrying figure from Lima warns you need to hurry across; the outlined figure from Lijiang is tentative and a bit apologetic; the blue (not green) figure from Pucon in Chile is assertive and sure of his space; inexplicably, the person from Rome seems to be wrapped in ropes; and confusingly, the Rio person is an amber/red colour. 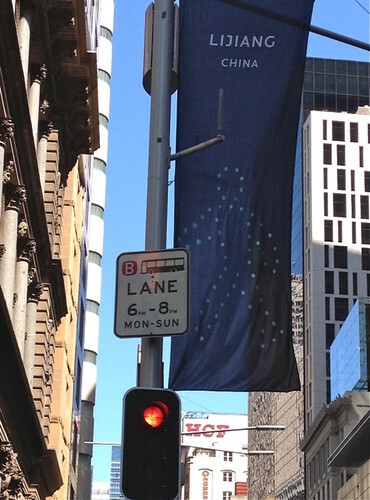 Mixed messages? The woman from Amersfoort, with her pony-tail and high heels, is the only recognisably female figure I've so far seen, though I gather there are others. I wonder if Amersfoort has randomly placed male and female figures throughout their city?